Camping anywhere near the hot springs requires a permit allowing you to camp at one of 19 designated sites. You can find more permit information here. An epic day trip or a mellow backpack, Conundrum Hot Springs is a must-do for any Coloradan. This run heads through nice aspen groves and culminates at one of the most unnatural-feeling bodies of water I've ever experienced—a large hot spring with expansive views back down the valley. The parking lot often fills up, especially on a fall weekend. Get there early and try to avoid the weekends if you can! If the parking lot is full, DO NOT park along Conundrum Creek Road. You'll be towed. Nights at the hot springs can get rowdy and potentially nerve-wracking for folks looking for a mellow experience. While the stars are incredible to experience from the springs, some people see the springs as a better opportunity to experience some partying. You can dispersed camp anywhere down valley from Silver Dollar Pond. This would be an amazing run. The trail is mostly runnable unless you hit the weekend/leaf peeping crowds. From the parking lot, head south on the obvious trail. Conundrum Creek Trail #1981 stays gently uphill for the first 7.0 miles. While beautiful, the trail is no different than other Aspen-area locales. Plow your way upwards to the hot spring! One of the most popular springs in the state of Colorado, Conundrum Hot Springs is a must-do for any warm water enthusiast. The views of mountains and fields of wildflowers are superb, especially in late spring. Not to mention, the warm 95-degree waters are inviting and pleasant. This trail sees very heavy traffic as it provides a fairly easy run through the woods and meadows with bridged stream crossings. Once you've had your soaking fill, head back to your campsite or back to your car. Guaranteed you'll feel more refreshed and ready to take on the world than you did a few hours before. 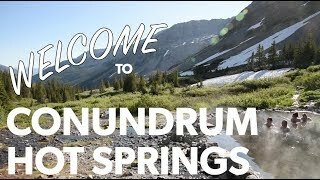 Some information on Conundrum Hot Springs.